This public barn for privately owned horses is only 10 minutes from downtown Vancouver. Located in North Vancouver, our stable is open seven days a week from 7 am until 10 pm, making it accessible for the equestrian enthusiasts of the North Shore and Greater Vancouver. "A horse owner myself since 1976, I understand the importance of a consistent daily routine. After all, my horses live here too. 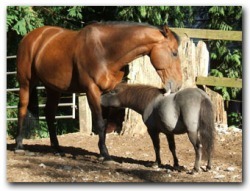 I maintain good working relationships with the veterinarians, farriers, feed suppliers, etc. to ensure availability and quality. My first priority is the barn."